Head out to the countryside and enjoy a relaxing day at the Loriendale Apple Orchard for their 29th annual Apple Day! Taking place on Sunday March 30 from 1.30pm-5pm, you can stroll through the orchard, enjoy a range of organic foods, buy organic produce from local producer stalls, watch the pressing of fresh apple juice on the wooden apple press, and have a picnic while enjoying the music provided by local musicians and choirs. Loriendale orchard has over 120 varieties of heritage and modern apples. 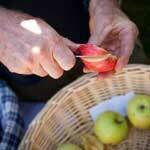 The orchard also grows nectarines, peaches, nashi pears, hazelnuts and a selection of berries. Loriendale Orchard is located at 16 Carrington Road, Wallaroo. Travel along the Barton Highway, north of Canberra then turn right at Spring Range Road. Why? Because nothing tastes better than freshly picked orchard apples!